If ever there was a primate out there that begged to have 'goblin' or 'gargoyle' in its name, it would be the beast below. 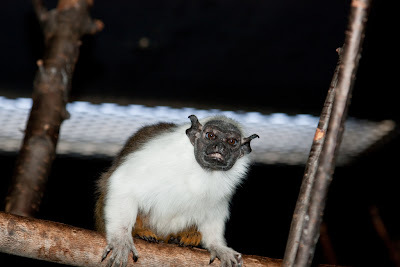 But no, someone came up with 'bare-faced' tamarin (Saguinus Bicolor). Really? That's the best you can do? These Amazonian monkeys are small, weighing in at around 1 lbs, and ranging between 19 - 27 inches. The parents share their duties, showing that they are progressive primates. The male carries the offspring most of the time (80% of births are twins), and then passes them back to mommy for nursing. These tamarins don't have opposable thumbs, which has got to be disappointing for them. What's the point of having a thumb if it isn't opposable? Can you even call it a thumb? But then, their thumbs, indeed all of their fingers, sport claws, so be sure there's a cage between you and it if you start flaunting your own thumbs. "Usually only the dominant female in a social group will mate. Other females are unable to ovulate as long as the dominant female's pheromones are present." No wonder they are almost extinct. Bare-faced tamarin parents can rest easy knowing their kids can't try hitch-hiking. I flaunt my thumbs daily (to my cat) and then silently thank god that kitties (for the most part) lack opposable thumbs.